"According to sources familiar with the company's plans, the new hardware specifications will allow device manufacturers such as Nokia to create cheaper Windows Phone devices. The announcement may be made as early as the company's MIX11 conference this week." Microsoft is rumored to announce flexible hardware specs for their Windows Phone OS at MIX11. Previously, makers of WP7 handsets had to adhere to a strict chassis requirement which meant all phones had virtually identical hardware with only the frame as the differentiator. With Microsoft's recent alliance with Nokia, it was expected a cheaper version of the Windows Phone OS would be needed as Nokia transitions away from Symbian. 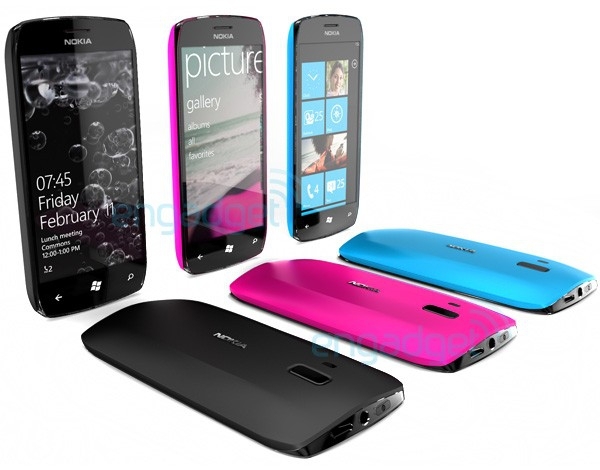 Hopefully, this potential cheaper version of Windows Phone will look closer to Windows Phone 7 and not the Kin OS. Great! Now we gonna get a bunch of underpowered and overpriced phones! Pocket PC, Windows Mobile or whatever you wanna call it all over again The latest news from MS camp point more and more to the fact that Microsoft didn't learn from past mistakes. Again, it turns it's back to the end user and start kissing carriers, manufacturers behinds. Well they will turn on MS before you can say MS if the sales not too good, there's always Android! Keep doing what you doing MS! Soon you will chase off last fans of your OS! They should just produce a higher spec chassis and make the current chassis the cheaper version. I don't think they'll announce flexible hardware specs - just Chassis 2, the mid-end chassis they've mentioned (but never shown) since the announcement of the platform. Suddenly switching to a loose hardware regulation would kill the platform, and take all their credibility away. They know that, and they can't risk that. I thought the current version was a cheaper version of a Windows Phone OS! The same time frame M$ was releasing the new WM7. Other manufactures were coming out with 1 GHz dual-core processors, 16GB internal memory expandable to 48 GB and other hardware better than M$;s lame hardware specs for the time. M$ WM7 phones are already priced cheap, now they want to dumb it down even more? I don't get it. You get pretty much any WP7 free under contract in the US. When was the last time you could get an iPhone for a penny? Making a cheaper hardware model will not affect the consumer, as you can't get better than free. You just diminish the brand with substandard models that tarnish the experience. People with decent devices don't post, people with crummy ones do. I realize that there are lots of places in the world that don't use the USs sell your soul for up front savings model, but even now, full price WP7s aren't uncompetative with full price iPhones, and higher end Androids, are they? Hopefully some flexibility will be allowed on possible sceen formats (but not lower rez), and maybe options for not having cameras. There are still many places one can't take a camera, in a phone or otherwise. Some of those belong to those corporate/government customers MS blew off and would like to win back. Agreed. I think it will be the HVGA (480 x 320) spec for the screen. I shudder at the thought of introducing another screen resolution for developers to target, but I think it would result in some significant savings on the handsets, which is what OEMs like Nokia want. Remember the spec we have right now is just a minimum - there's nothing stopping HTC or anyone else from building a dual-core monster with 1 GB of RAM and 64 GB of storage if they wanted to. Besides, the cost of the current spec is determined by the market, not Microsoft. The Chassis 1 spec will get cheaper over time, but not fast enough for the likes of Nokia. Isn't the USA like Canada though in that you have the $599 phone with no contract, $199 on a one year contract, $99 on a two year contract, and free on a three year contract? If the cost of the phone were to drop, you could have the phone sell for $399 on no contract, be $99 on a one year contract, and free on a two year. Those are some decent numbers - not everyone waits for their contract to expire; phones break, they need replacing. I too worry that the "low end" Windows Phones might tarnish the brand, but I have a modicum of faith that Microsoft will ensure that even a lower-powered Windows Phone will still live up to the experience they want.